Giles has an indescribable and overwhelming affinity for animals and the natural world. His relentless determination and commitment, together with an in-depth knowledge of wildlife and a wealth of experience with big cats, has helped develop an extremely successful career with captive tigers. Until recently Giles was Head of Tigers and Conservation Manager at Australia Zoo, managing one of the only ‘hands on’ facilities for tigers in the world. His work was featured in the BBC2 Tigers About The House (2014) and Tigers About The House – What Happened Next (2015), five one hour episodes followed the journey of two tiger cubs that he hand raised at home, and highlighted the plight that their wild cousins face. His incredible passion for conservation and his dedication and motivation “to make a difference” has taken him around the world. He lived in Central India for 18 months, not only observing tigers in the wild but helping carrying out vital conservation work, trying to help make a contribution to the survival of the tiger. 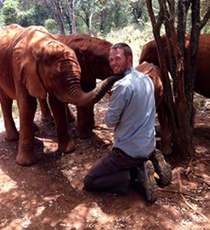 Giles endeavours to instil his passion for conservation in every zoo he has worked at. In 2008 Giles played a pivotal role in acquiring three Sumatran tigers from Indonesia. This was hugely significant for several reasons, not least because they were the first to be released from the range country in over 27 years. As a consequence, in 2013 two of the most genetically important Sumatran tigers in the world were born. During his 13 years at Australia Zoo, Giles was very involved setting up and managing the various partnerships worldwide with conservation projects affiliated with the zoo. Giles’ unfaltering drive and infectious enthusiasm inspires others and his natural presenting skills are evident, both in front of a camera and to a live audience. He has been a contributor to numerous mainstream TV and Radio programmes both in Australia and in the UK. He is currently employed as Director of Big Cats and Conservation at The Big Cat Sanctuary in Kent.